The must-see show of 2019 is coming to Topeka and we want you to be there! Cirque Du Soleil Corteo is coming to the Kansas Expocentre. 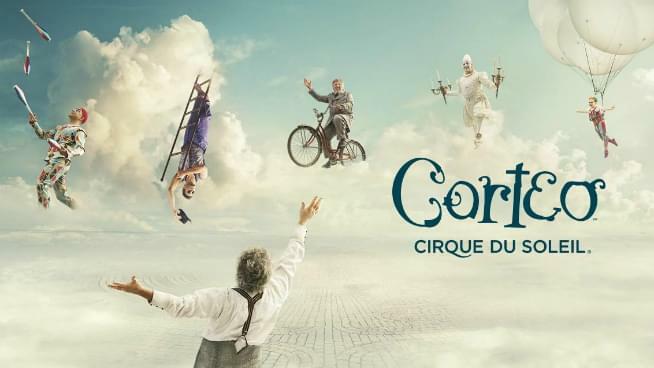 Corteo, the latest arena production from Cirque du Soleil will be in Topeka from April 18 to 21, 2019. Life is made of unforgettable moments, and Corteo is the celebration of them. Join the parade and get carried away with life! We also want to say congratulations to Joseph R. He submitted a picture of his daughter pretending to be a jack in the box. He received 4 Orchestra level tickets (total value $440)! on April 19 or April 20 – choice of two entrees with sides, plus a charcuterie board. Beverages not included. Restaurant will call to confirm reservation time. Taxes and gratuity included​ in package. on April 19 or April 20 – includes hotel parking. Taxes included. Room will be reserved under package purchaser’s name. to an April 19th or April 20th Cirque Du Soleil Corteo performance at the Kansas Expocentre. Must select either the Friday evening, Saturday afternoon or Saturday evening performance. Taxes, fees and parking included. Check out the package here! You can select the Friday evening, the Saturday afternoon, or the Saturday evening show, then click Type and select Couple’s Package to see the offer and available seats. Package Details: Package available on select seats, not valid on prior purchases and cannot be combined with any other offer or promotion. All sales are final, no refunds or exchanges. Offer ends April 8 at 11:59 pm local time. This show is about a story of a clown named Mauro, who is celebrating life in a joyous way. You will not want to miss the unbelievable performer’s toss and turn in the air. The mission of Cirque du Soleil is to invoke the imagination, provoke the senses and evoke the emotions of people around the world. Corteo first premiered in Montreal in 2005 and performed as a Big Top show before transforming in an arena show in 2016. In the remount process, from the Big tent to the arena, new acts have been added to the Corteo show with a small adaptation to the original story line. From a group of 20 street performers at its beginnings in 1984, Cirque du Soleil is a major Québec-based organization providing high-quality artistic entertainment. The company has close to 4,000 employees, including 1,300 artists from more than 50 different countries. Cirque du Soleil has brought wonder and delight to close to 155 million spectators in more than 300 cities in over forty countries on six continents. This is a must see event perfect for family and friends!